Students work together to build new technologies at last year's Technica, which attracted about 900 participants. Gesna Aggarwal ‘21 joined a robotics program in middle school, took a computer science elective in high school and chose CS as her major at the University of Maryland. Yet after years of study, she still sometimes feels uncomfortable in the male-dominated field. Aggarwal found one last year in Technica, the world’s largest all-women hackathon, established on campus by UMD students in 2015. As a freshman who was still getting used to college life, she was relieved by the encouragement and inclusivity at the event, reassuring her it’s possible to be a woman and have a successful career in tech. 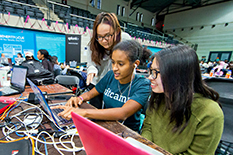 Tomorrow, about 900 high school and college students from across the country will meet at Reckord Armory to develop digital solutions to technology companies’ challenges, attend workshops and mingle at the 24-hour computing bazaar. Not everyone involved identifies as a woman; Technica also welcomes gender non-binary people, and volunteers and mentors can be any gender. The theme of this year’s event, “Light the Way,” is meant to inspire women to pursue STEM careers and to honor female trailblazers in the field, said Ming Gault ’20, a marketing director for Technica. “[Students] can lead the way for other women who were maybe hesitant about it, but they see their friends doing it, they see other women in the community doing it, and so they’re lighting the way for others.” said Gault. In partnership with the Maryland Center for Women in Computing, Technica is introducing a new track, Tech + Research, to connect participants with faculty from institutions across Maryland to learn about and conduct computer science research. In 2017, women in the United States held 26 percent of professional computing occupations, according to the National Center for Women & Information Technology. While there’s a gender gap in computing careers, it’s even deeper in computing in academia, said Kate Atchison, assistant director of the center. While many of the participants are majoring in computer science or a related field, about one-third of those who attended in 2017 were from other majors, said Gault, a public health science major. Gault, a public health science major, hopes that Technica will show students that you don’t have to be in computer science to be successful in the tech world. “I want this experience to show them you get to meet these sponsors, you get to meet these mentors and you see that you can do it as well,” said Gault.